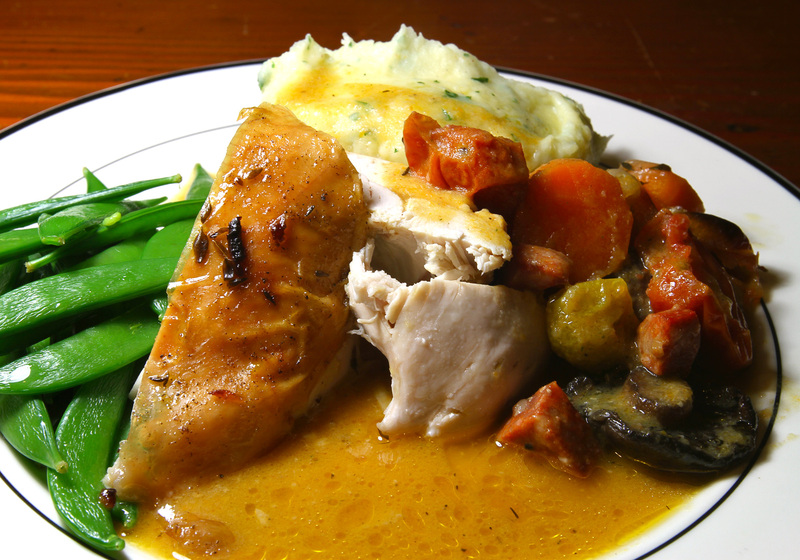 Right, so a nice simple (ish) Chicken Pot Roast. 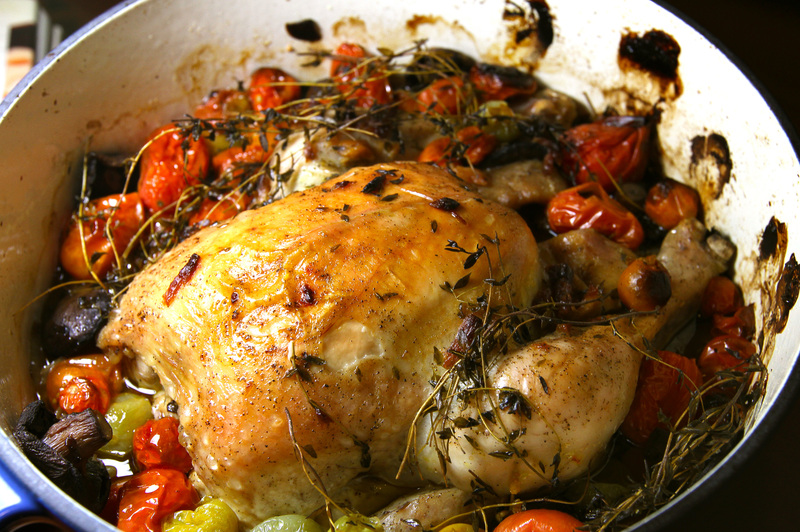 This is a little variation of Granny Bruce’s Chicken (recipe here) It does take a few hours in the oven but it’s worth it. I think with winter rapidly approaching I’m craving stuff that warms you up. Plus it gives me the chance to use my new pan again! For this you’re gonna need a casserole dish that you can put in the oven with the lid on. If you don’t have one it’s well worth investing. 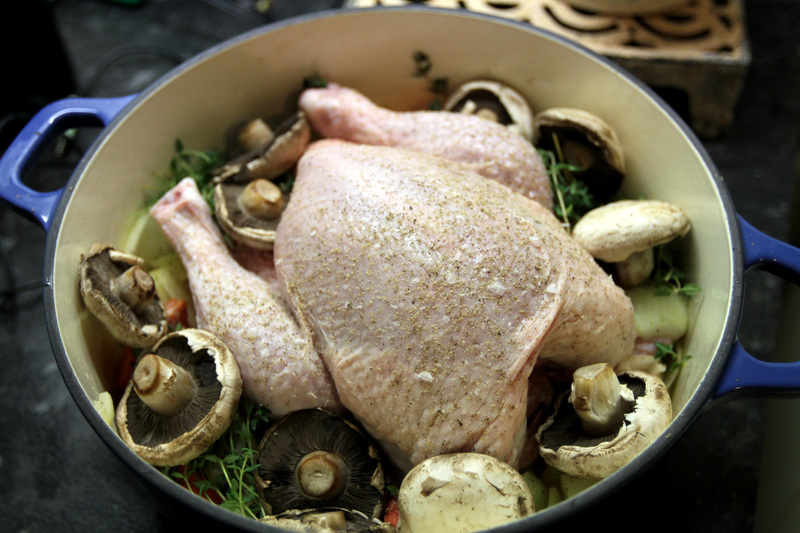 1 free range organic chicken – make sure to get your chicken out the fridge at least an hour before you want to cook it. 1. So in a small pan get it heated up to a medium to high heat. 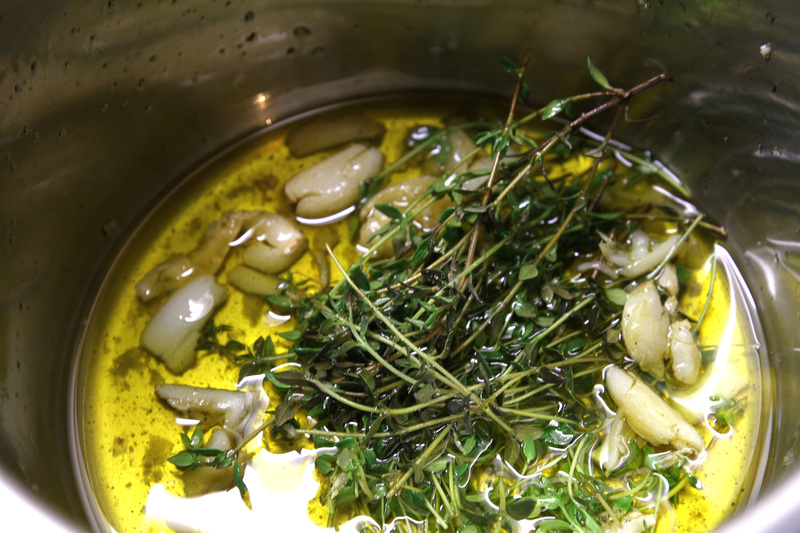 Add 4-5 tablespoons of the olive oil, add 5-6 cloves of garlic smashed up a bit but not chopped. It should bubble away nicely. Now take off the heat and add a big bunch of thyme. Pop the lid and put to one side. This should infuse the flavours into the oil. 2. Ok so get your casserole pan on a low heat. Roughly chop the onions and carrots and pop in the pan. Get your chicken and place on top of the vege. 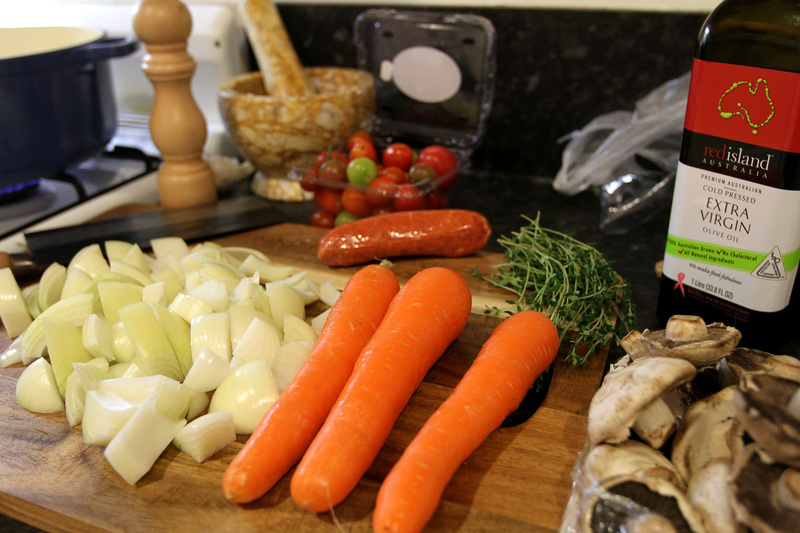 Now add the mushrooms, whole round the edge and the rest of the thyme. Add the tomatoes whole then season with salt and pepper. 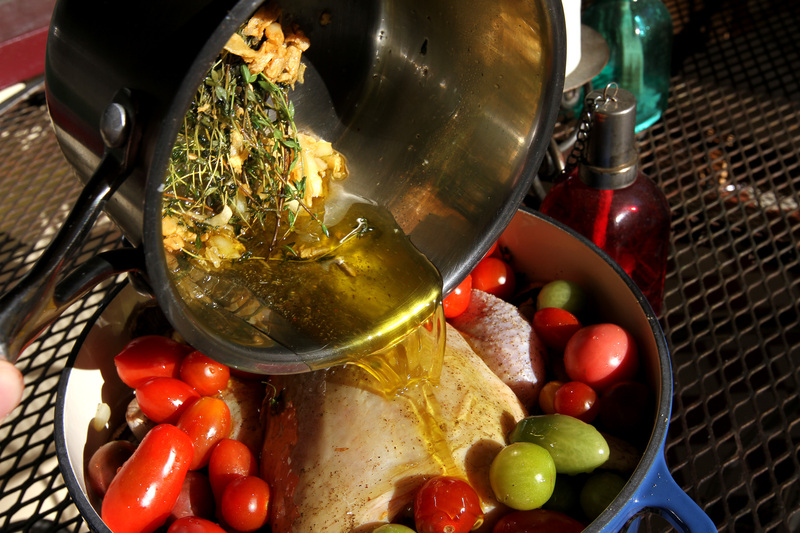 Now pour the infused oil over the chicken. Pop the lid on and put in the oven on about 140°C. 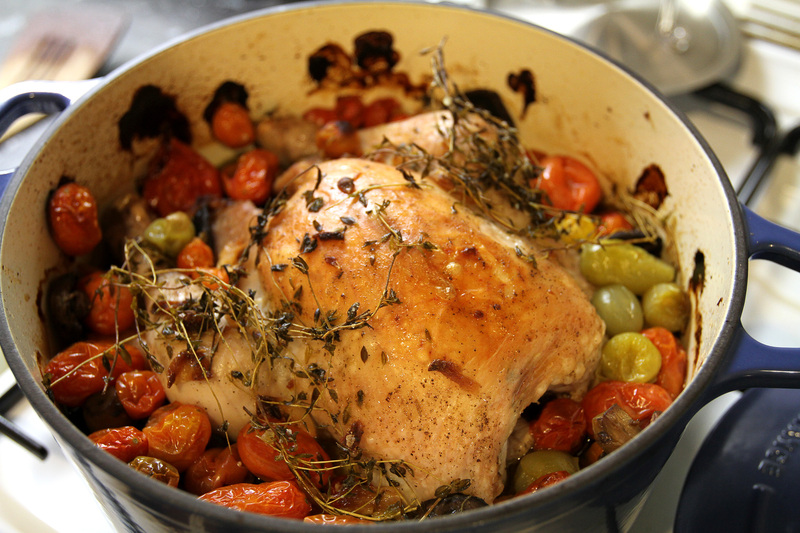 Cook this in the oven for about 2 hours. After 2 hours turn off the oven but leave the pan in there. 3. Now get your potatoes on. Water, salt and potatoes and bring to the boil in case you didn’t know how to cook potatoes. 🙂 Once they are cooked, strain and add butter, milk, salt and pepper and mash well. I added a bit of parsley as well. 4. 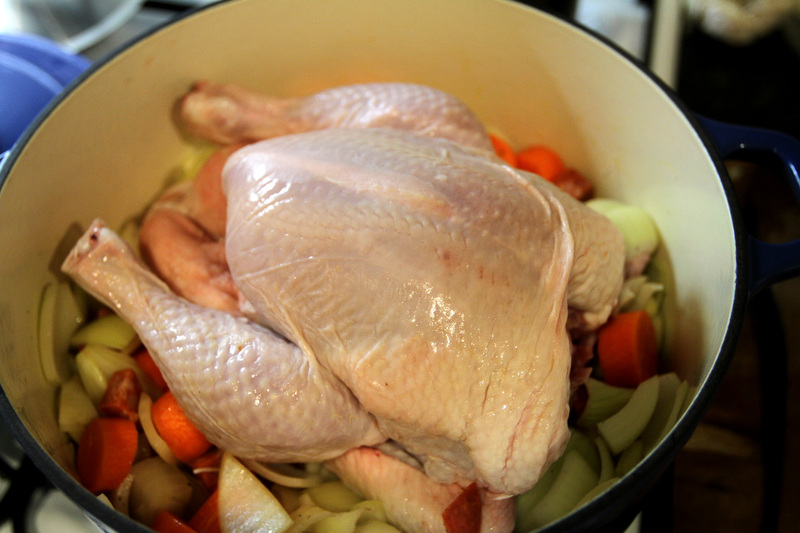 Ok so now take the casserole out the oven, remove the chicken gently and put on a chopping board. (The legs may well fall off but don’t worry about that). 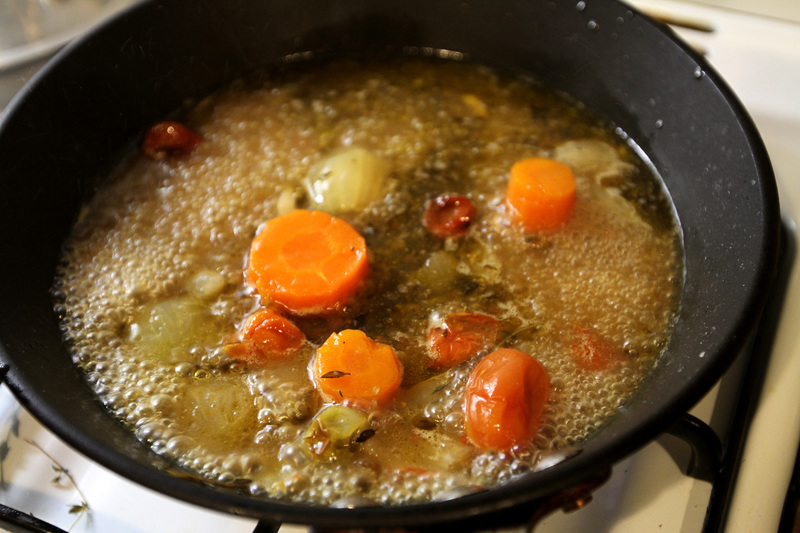 Get a small frying pan and spoon off about 2-3 ladles of the liquid. 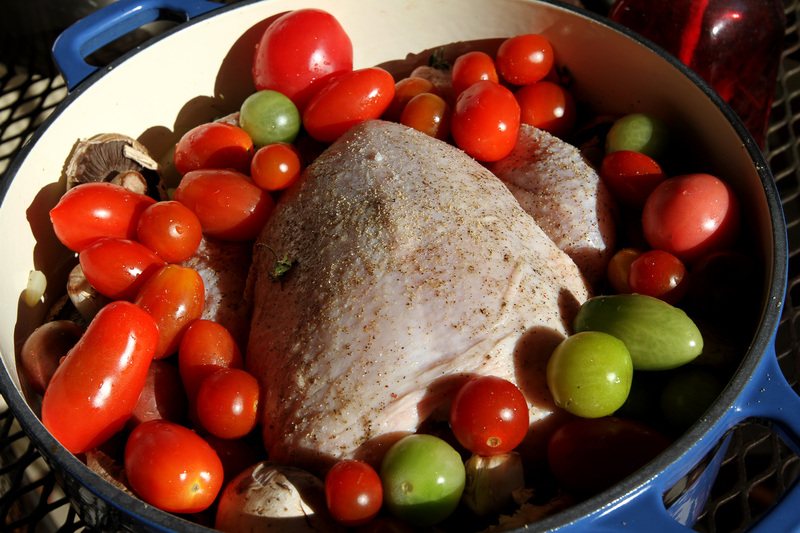 Add a few of the carrots, tomatoes and a bit of the chicken flesh picked off from the legs. 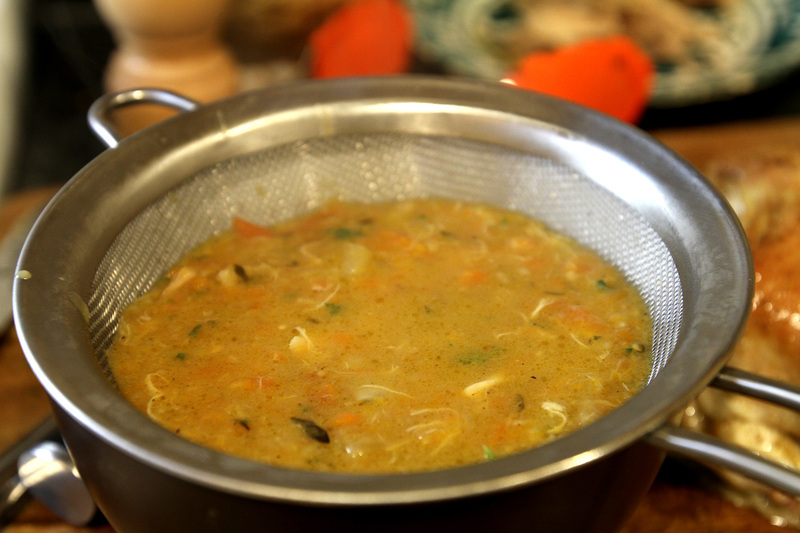 Bring this to a simmer and smash everything up into the liquid. 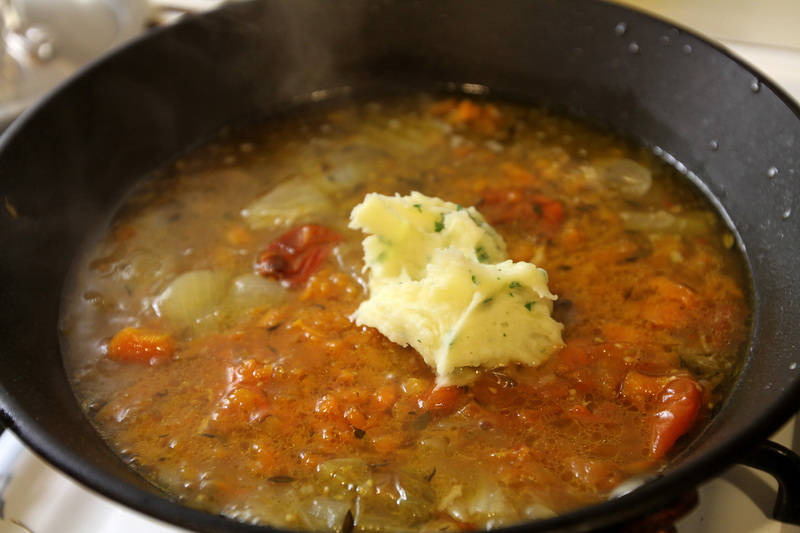 Now add a spoonful of the mash into the sauce and mix well. 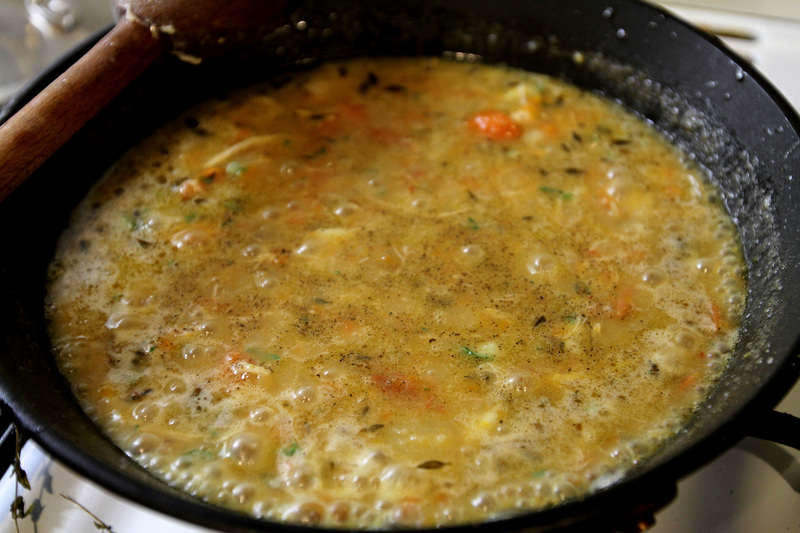 This will thicken the gravy. 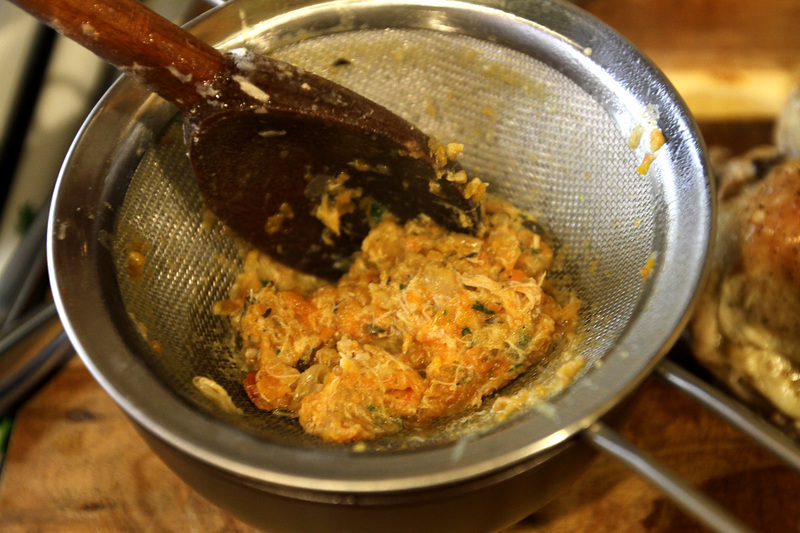 Strain through a fine meshed sieve so you get a nice smooth sauce. 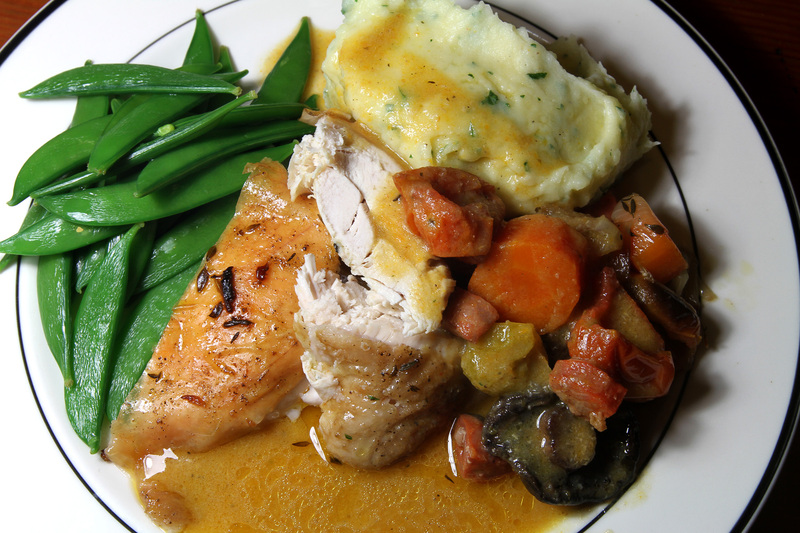 Carve the chicken, pop on the plate with the mash and some of the vege mixture from the casserole dish and serve with some extra vege of your choice. I used some sugar snap peas.